Beef Shorthorn bulls met a solid trade throughout peaking at 8,500gns at the society’s official sale at Stirling on Tuesday 5 February. Trade was headed at 8,500gns by Burnside Elite TI +16, SRI +14, from W and J McAllister, Ballymena, County Antrim. This 21 month old roan bull, by Creaga Dice and out of a homebred dam, was secured by Messrs Thomson, Roddick and Laurie (Shawhill Shorthorns), Lockerbie, Dumfries and Galloway, who recuperated some of their outlay taking 4,000gns for Shawhill Evaristus TI +13, SRI +10, a 23 month old red and white bull by Alvie Blue Eyedboy and out of Alvie Briar Briony, purchased by Aucheneck Estates, Killearn, Glasgow. The same buyers paid 6,000gns for Highlee Eric TI +15, SRI +8, a 22 month old roan bull by Astrix of Upsall and out of Croxtonpark Lily. This one was bred by T Severn, Halifax, West Yorkshire. 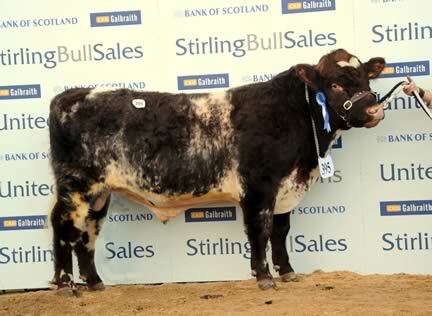 Aucheneck Estates invested 5,000gns in a third bull, the reserve overall champion Blelack Hildalgo TI +11, SRI +9, a 22 month old red and white bull by Loch Awe Saxon S098 and out of a homebred dam. This one was bred by N Massie and Sons, Aboyne, Aberdeenshire. Messrs Massie also took 6,000gns from Page Farms Partners, Bedale, North Yorkshire, for Blelack Fortune Maker TI +9, SRI +8, a 20 month old roan bull sired by Alta Cedar Samurai 46T and out of Butterfield Forester 50H. The pre-sale overall champion Chapelton Exemplar TI +23, SRI +21, went for 8,000gns to W S Robson, Newcastle upon Tyne, Northumberland. Exemplar, a 22 month old roan bull bred by D J Biggar, Castle Douglas, Kirkcudbrightshire, was by Chapelton Typhoon and out of a homebred dam. 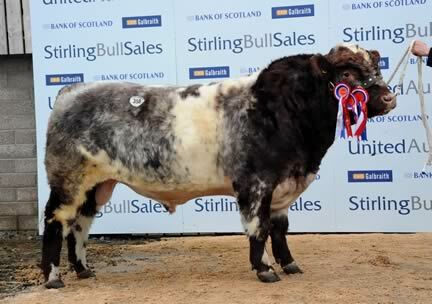 “Typhoon had excellent conformation with muscling through the rear and was an exceptional example of the breed,” commented judge Friar Thomson, of Forfar. Mr Biggar also took 7,500gns for Chapelton Emir TI +21, SRI +20, a 20 month old roan bull by Glenisla Banqo and out of a homebred dam. Emir was secured by the College of Agriculture, County Antrim. At 4,000gns the same breeder sold the 22 month old red bull Chapelton Emissary TI +20, SRI +16, by Chapelton Typhoon and out of a homebred dam to the Crofting Commission, Inverness. The day’s second 8,000gns bid was made for the 21 month old roan bull Tofts Whisky E775 TI +20, SRI +16, by Tofts Jovial S147 and out of a homebred dam. Whisky was bred by J Playfair, Kelso, and went home with D M Dickie, Sanquhar, Dumfriesshire, re-investing the 4,800gns they had taken from S S Horton and Sons, Cirencester, Gloucestershire, for the 21 month old roan bull Knockenjig Eclipse TI +27, SRI +27, by Cavans Northern Light and out of Glengloy Flossy Camilla. Mr Playfair secured 6,500gns from Messrs Ward and Sons, Carnwath, Lanarkshire, for Tofts Academical E729 TI +17, SRI +15, a 21 month old roan bull also sired by Jovial and out of a homebred dam. At 4,200gns the same breeder sold the 22 month old Tofts Lionheart E754 TI +29, SRI +20 to W S Muir, Stromess, Orkney. This roan bull was by Tofts Atlas Z900 and out of a homebred dam. Craigeassie Tobias TI +21, SRI +17, went for a call of 6,500gns to J H D Fanshawe, Naseby, Northamptonshire. By Dunsyre North star and out of a homebred dam, this two year old white bull was bred by Lady Glendyne, Forfar, Angus. Through the ring at 6,000gns was Erasmus II of Upsall TI +19, SRI +11, a 22 month old dark roan bull by Atilla of Upsall and out of a homebred dam. He was secured by A J Hunter, Brae, Shetland and bred by the Hon G Turton, Thirsk, North Yorkshire. 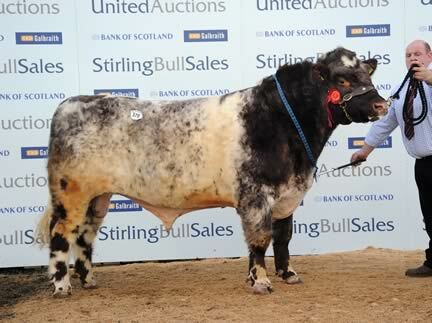 Caldwell Poser TI +21, SRI +17 sold for 5,800gns to Lochty Farm, Anstruther, Fife. Entered by H P Whittaker, Cornhill on Tweed, Northumberland, and bred by R Hodson Walker, Poser was a 22 month old roan bull by Tofts Prince Xavier X626 and out of Croxden Marigold Fireworks 3. Traded at 5,200gns was Fearn Elvis TI +19, SRI +15, a light roan bull by Fearn Boomerang and out of a homebred dam. This 20 month old bred by J Scott and Partners, Tain, Ross and Cromarty, went home with J H Younger, Haddington, East Lothian. The same breeders took a bid of 4,800gns from N B Taylor and Son, Penrith, Cumbria, for the 22 month old Fearn Empire TI +15, SRI +16, a red and white bull by Balmyle Crackle and out of a homebred dam. Making a further 4,000gns for Messrs Scott and Partners was Fearn Emperor TI +8, SRI +9, a 22 month old red and white bull by Balmyle Universe and out of a homebred dam. He was purchased by Buitelaar Production, Castledermot, County Kildare. At 5,000gns the two year old roan bull Lowther Eclipse TI +23, SRI +22, from C Lowther, Penrith, Cumbria, was secured by T C Brown, Towcester, Northamptonshire. Eclipse was sired by Blelack Rupert and out of LS Special K.
Glenisla Enigma 864 TI +18, SRI +19, made 5,000gns selling to J Stewart and Partners, Peebles. Bred by Major J P O Gibb, Blairgowrie, Perthshire, Enigma was a 17 month old roan bull by Glenisla Chieftain and out of a homebred dam. A bid of 4,500gns won Uppermill Retro TI +8, SRI +5, for J and M Brims, Wick, Caithness. Retro was a 20 month old red and white bull from J Porter, Lisburn, by Trunley Zorba and out of Rothes Jordan. Messrs Severn paid 4,200gns for Podehole Elite TI +9, SRI +8, from H Horrell, Thorney, Cambridgeshire. This 22 month old roan bull was by Trojan of Craigeassie and out of a homebred dam. Meonhill Emperor TI +3, SRI +3, was knocked down sold at 4,000gns to R James, Fadmoor, North Yorkshire. Bred by L E P Farms, Hambledon, Hampshire, Emperor was a 22 month old roan bull by Meonhill Highland Beau and out of a homebred dam.